Spy the truffle cheese fries lurking behind my burger (near Mr G&J)? Decent burger, GLORIOUS fries. Hello Dear Reader! We’ve made it! We have conquered 2015 and left it eating our dust! Welcome to the wonder that is ginandjuicing in 2016! What better way to celebrate the new year than by shoving a burger in your face? No better way I say, so that’s why I took myself off to one of the originators of the London burger scene, GBK, which was set up by three Kiwi guys waaaay back in 2001. The burger scene, especially in London, is absolutely flooded with new burger joints appearing every week. In 2014 I experienced what can only be described as a ‘burger overdose’ after one too many sessions at Meat Mission and couldn’t face a burger again for a long time. Happily, those days are long gone and I am back to shoving them in my face with alarming regularity (thank God for stretchy pants). So, with the plethora of choice in mind, why would someone choose to go to GBK other than one of the new, shiny places that have just appeared? GBK does a good menu, with some more gourmet meat choices (such as buffalo), interesting beef and chicken options and good stuff for vegetarians. I went for the GBK bacon and cheese burger, served medium, with truffle cheese fries and onion rings. Now, let’s get this out of the way. The truffle cheese fries are a thing of glory. GLORY. Unctuous cheese sauce that hums with delicious truffle, oozing onto thick cut fries with a smattering of fresh parley on the top that cuts through the richness of the dish nicely. Fabulous. So good. Please order them. The burger? Good. 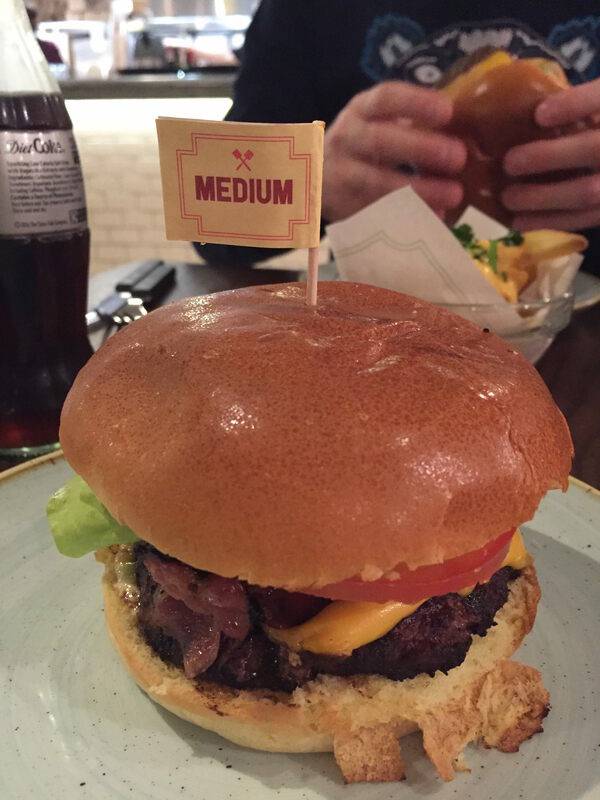 Served a slightly well-done type of medium, but the brioche bun was fresh, the patty held together well and the beef was tasty. Is it a stand-out burger, one that makes you leave your wife and kids and take off across the country on a wild, hormonal adventure of love, lust and ground beef? No. It’s comparable to the Byron Burger, but slightly lighter on the bacon (which has never been considered a good thing IMHO). A good, standard burger that you have a long and happy relationship with while driving a WV Polo and dreaming about Tina in Accounts (or the Bacon Cheeseburger at Meat Mission, which is a true dirty fantasy). So, Dear Reader, expect a good solid burger experience at GBK and please, for the love of God, order the truffle cheese fries *Homer drool*.